Originating in the Scottish borders, this is another sweet bannock, like a shortbread but the addition of the egg yolks to the dough makes them lighter and more like a cross between a cake and a scone. The crystallised ginger is sandwiched between the dough and gives it a real festive, but surprisingly delicate, flavour. If you like it a little hotter, try doubling the ground ginger recommended in the dough and adding another ounce of crystallised ginger. I found the recipe here and stuck to the instructions but found that even when I adjusted the temperature for a fan oven they cooked far quicker than the 45 minutes as directed in the recipe. I checked on them after half an hour and found they were starting to overcook so I’ve adjusted accordingly in the instructions below; if you have a better oven than me, you might find they’ll need longer, though. The amounts given for the butter and sugar are a little awkward to convert to US cups, so I’ve given them as tablespoon measurements instead. 1. Preheat the oven to 170C and prepare a baking sheet covered with tin foil. 2. Beat together the butter, egg yolks, sugar and golden syrup until smooth and creamy. 4. Split the dought into two equal halves. Roll out the first half into a rectangular shape about a quarter of an inch thick (you might need a little dusting of flour on the work surace to stop the dough from sticking). 5. Place the dough onto the baking sheet and cover with the chopped crystallised ginger. 6. Roll out the second half of the dough, getting it a close to the same size as the other half as you can, then place it on top of the crystallised ginger. 8. Shape the trimmings into a round to make the bonnach faillaid, and use it to pick up as much of the flour used on the worksurface as possible. 9. Mix the egg yolk and milk together to make the caudle and brush it over the top of the dough. 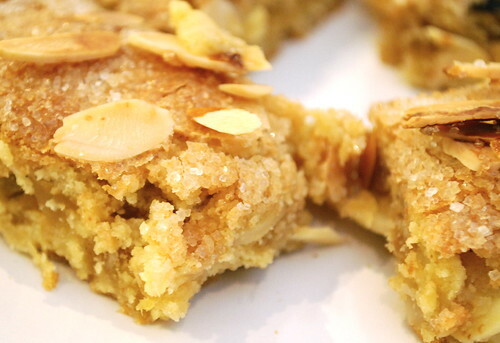 Mix together some almonds and sugar and spinkle liberally on top. 10. Bake in the oven for about 30 minutes, until the top is golden brown. As the bannock cools (it will harden a little as it does so), cut into slices. Use the bonnach fallaid as an offering to the Good Folk. 1 Golden syrup is a form of inverted sugar syrup. An important ingredient in many traditional sweet recipes found in Britain, it’s apparently hard to get hold of in many parts of the US. The syrup gives a slightly sticky, moist sweetness than using sugar alone would, but it’s not essential. If you’re unable to get hold of it, try substituting with an equal amount of honey and/or using a different kind of sugar like light muscovado sugar, or golden caster sugar in the recipe. If using only sugar, use 4oz instead 3oz for the recipe (although white sugar would still be the best to use for the topping).